Radhouane El Meddeb is dreaming up a performance together with several Tunisian artists. 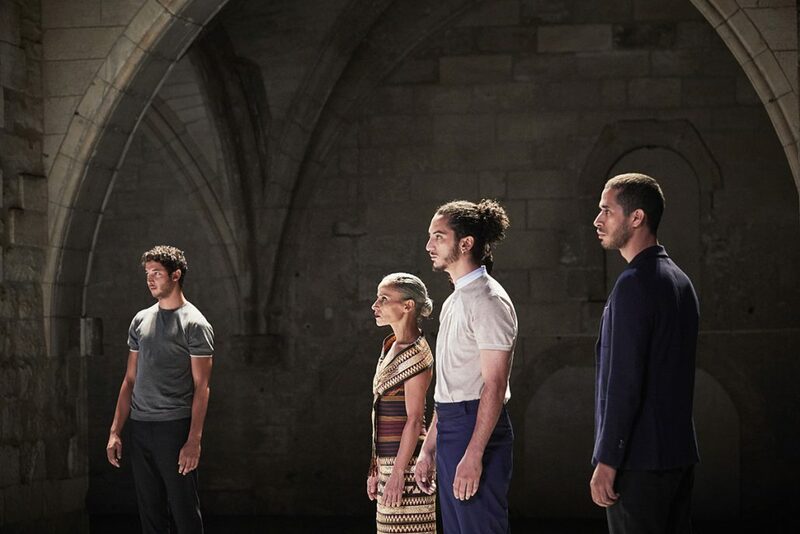 The new work by the choreographer Radhouane El Meddeb is returning to Tunisia, seeking out the spaces between tradition and revolution, between memory and the present, homeland and exile, land and sea. Moïra Dalant: “Facing the sea, for tears to turn into laughter” could be seen as an autobiographical performance, from the point of view of sensations. Radhouane El Meddeb: This performance was born from a visceral desire to return to the country of my birth, to spend time there, and to work there with artists; it’s the first project I’ve ever worked on with Tunisians in Tunisia. My personal history is therefore mixed with histories of the ten artists I worked with, while also trying to pay attention to what has been happening in their country over the past few years. I haven’t lived in Tunisia in 20 years, this spatiotemporal distance deeply changed my relation to the country, and Tunisia itself has evolved a lot, socially, economically, and politically. I crossed a border, and so my status is that of a Tunisian who left Tunisia. I moved from theatre to dance, from Tunisia to France, and the knowledge people had of me before I left changed, as if I’d lost my place in the cultural and artistic scene of Tunisia. I used to hear a lot about those who’d left when I still lived in Tunisia, about how leaving was in some ways an abandonment. I have missed major political events, like the revolution, and it has only widened the gap. I wasn’t there either when my father passed away right before the revolution. He was one of the strong ties between here and there for me. This performance can therefore be read like an emotional quest, similar to catharsis. I tried to understand this thing broken inside me, but also the experiences and changes that remain of the Tunisian revolution. I talked with the people in my neighbourhood, my family, and the artists I worked with to get a glimpse of the fear they may have felt, of their point of view. They talked to me about courage, about anger against the dictatorship, about their excitement in 2011 because they were ready to do anything back then. It seems that the fight continues on today, clouded by illusions and disappointments, because the middle class keeps getting poorer, the country is almost on its knees economically-speaking, and because the presence of extremism and fundamentalism is particularly strong. When I left Tunisia in 1996, with Ben Ali in power, extremism and fundamentalism were weak there, and stronger in Europe. Salafists have a considerable power of conviction in terms of politics, they seduce the isolated and the poor, all those people who were left behind by the revolution. Nowadays, Tunisians are no longer afraid of talking and exchanging their point of view, but their economic, political, and social demands aren’t being heard, far from it. I want to understand all that and to analyse the distance and pain that I feel. The Mediterranean basin was shaped by an enigmatic history, by political conflicts and economic mutations. MD: How do you translate on the stage the bridge between your double French / Tunisian culture and the Tunisian history of your performers? REM: I started dancing in Tunisia, but it was in France that my dream of being a dancer and a choreographer came true. You can see the marks of a French training in me, but the culture of my memory is Tunisian. My work combines both of those cultures, in relation to the past and to the present. 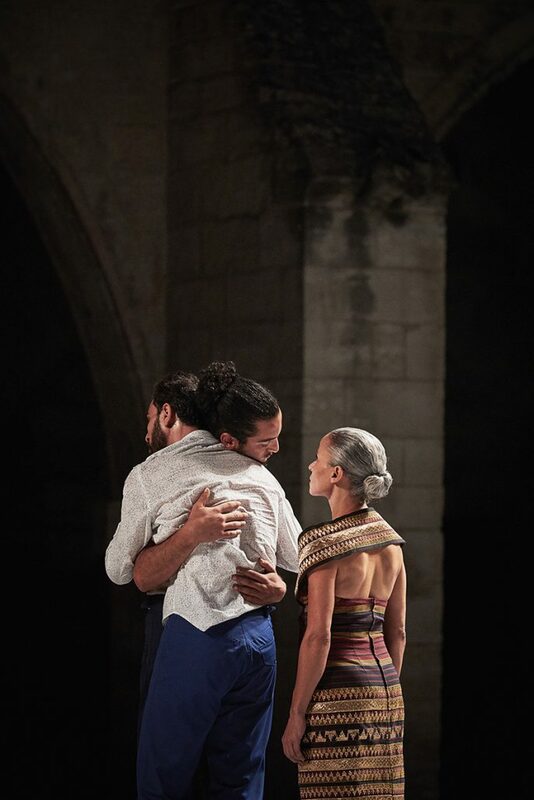 I questioned everyone’s artistic discipline and asked the performers about their relation to the real, especially since they experienced the revolution in all its violence. And I tried to find a way for dance to tell all those stories and sensibilities, and absorbed all of them in my solitude. 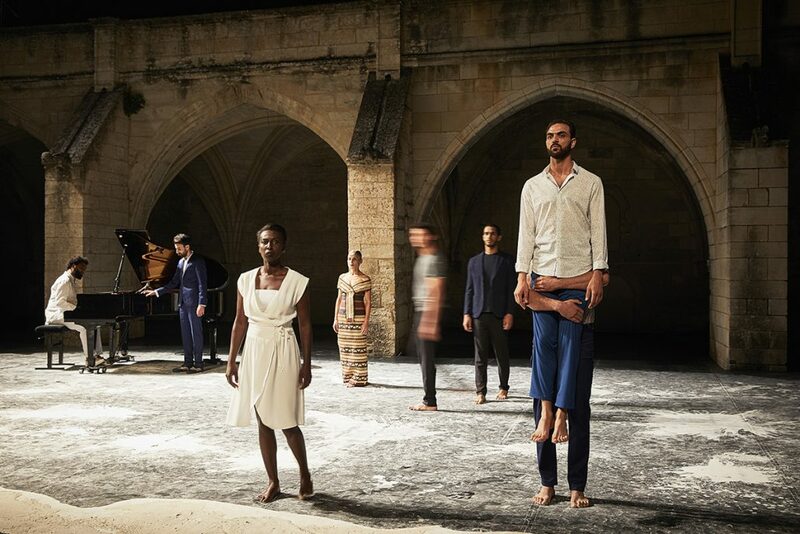 The performance brings together several generations of Tunisian artists – dancers, actors, circus performers, musicians – who dream up a performance together. MD: The title, “Facing the sea, for tears to turn into laughter”, is about a poetic space as much as a physical one. 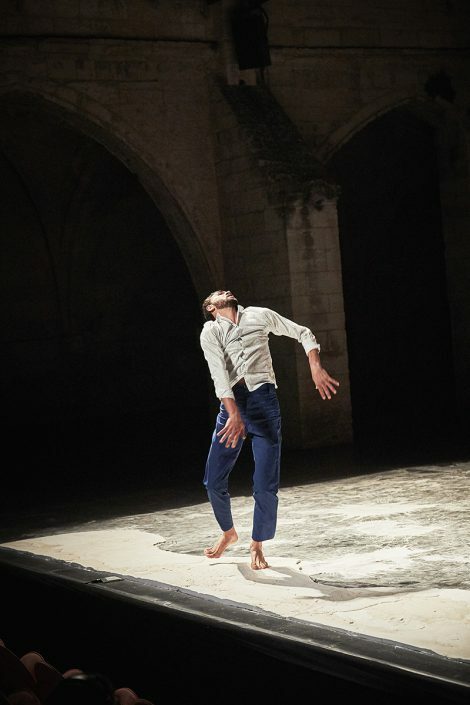 REM: I need to define the space, to place the body and choreography within a context, even if it is sometimes defined late in the creative process. 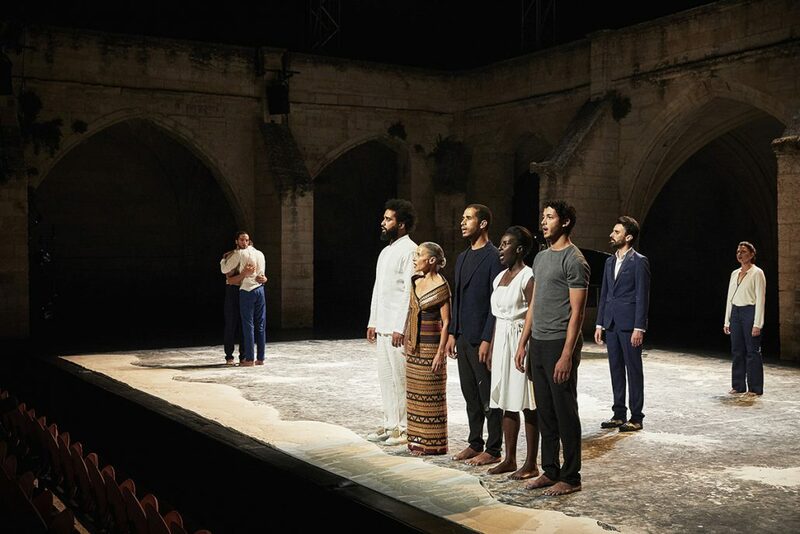 In this project, the Tunisian body is ‘facing the sea’, it tells of the Tunisia of the present, of the past and of the future, in its unique relation to illusion and disillusion, looking at itself while also looking towards Europe, beyond the Mediterranean… Sorrow emerges, mine and theirs, and the causes for this sorrow are different. Onstage, the space is empty and vast, all the better to tell of this traditional and modern horizon, this symbolic open window, this tradition of a coastal culture. The Mediterranean basin was shaped by an enigmatic history, by political conflicts and economic mutations, by secrets and distress; the sea seems to be the protagonist of those troubles, a place of tragedy and dream. Tunisia, like Lebanon, enjoys a traditional relation to water, it’s a place of paradox: of purification and celebration. At night, the sea becomes a place where one can escape after a long day of worry, uncertainty, and political debates. 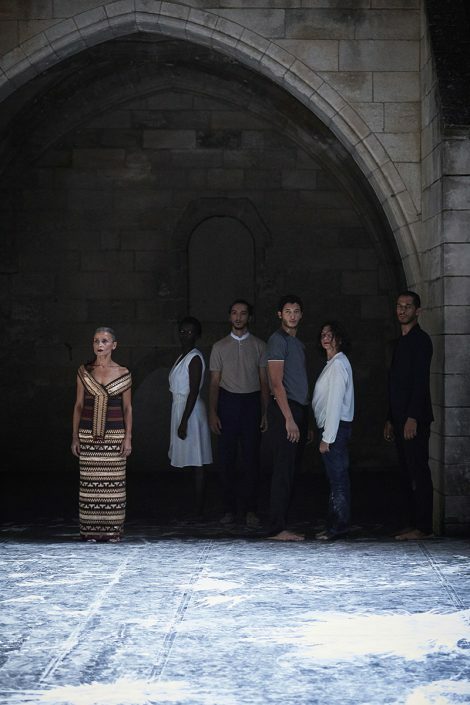 The performance is also about mourning: my own personal mourning and theirs, my tears and theirs, which leads to two explorations, one intimate and deep, the other open to the outside and, in a way, horizontal. I need to tell my hardships and my joys because they are a universal experience. 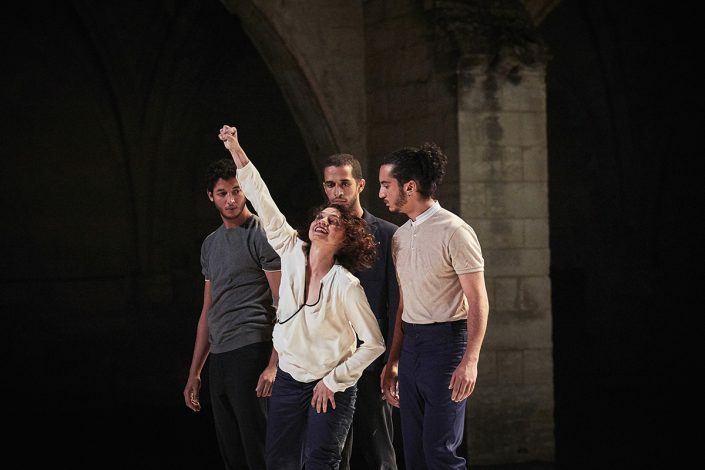 The performance ends with laughter as a tribute to the Tunisians who can, while facing the sea, tell about the suffering and chaoes and immediately turn to laughter. “Facing the sea, for tears to turn into laughter” is about this outpouring of laughter, tears, food, and words. Tunisia enjoys a traditional relation to water, it’s a place of paradox: of purification and celebration. MD: It’s a performance about exile and about coming back, about those who leave and those who stay, which tells of a transformation, or a mutation. REM: The Tunisian people are a mix of cultures and traditions, due to many movements of population. The country was built by those movements. There’s no border to me, that’s why I could easily slide or ‘jump’ from theatre to dance, from Tunisia to France. I can sometimes spend whole months working abroad. I want to understand the suspicion my return and my presence in Tunisia elicit. Separation doesn’t exist for me, but for them, it’s a tangible thing. Being put aside like that is harrowing. The way people look at the other, especially when his or her difference is clear, can be pretty violent, even xenophobic. That’s why I want this performance to resemble aspects of rituals in the openness to the other. I want this dream to unfold. It is fear that turns us to selfishness, that makes us reject others. My work has been about those questions for a few years now, both in terms of style and substance: how can the body tell those things? MD: The bodies are accompanied by a monologue in Tunisian. REM: Everything that goes on onstage is addressing to the audience and the sea, and that’s true of the text as well. We question our contradictory relation to the real, just like in that painting by Magritte in which bodies seem to be rising into or coming down from the sky. Is it a fall or an ascension? Accompanying the text declaimed by the actor, the music also has a primordial influence on the performance, which was often inspired by the traditional songs about the days that go by like in windmill… The lyrics of those songs talk of tears, of matter (wind, earth, water), and they carry almost tearful nostalgia, very affected and languid. Within all the contrasts of this aural and visual space, the bodies appear full of something tiny, almost invisible, as if they were in waiting and holding back – always facing the sea. 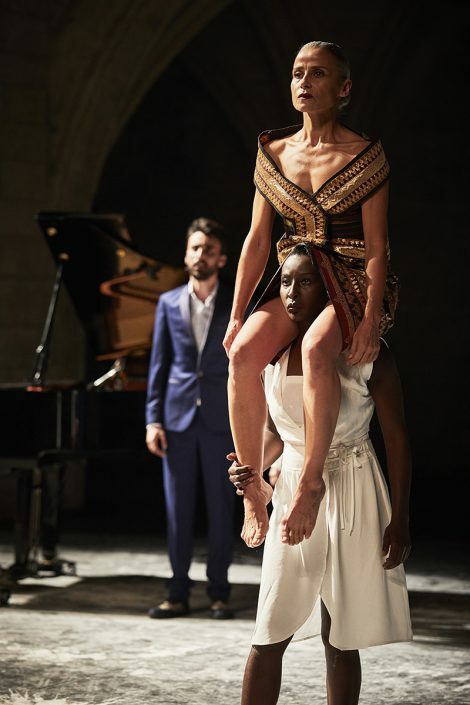 It’s a performance that takes place between the sky and the earth, between fear and hope, land and sea, past and future, because we don’t know today what will happen to the Tunisia of tomorrow. 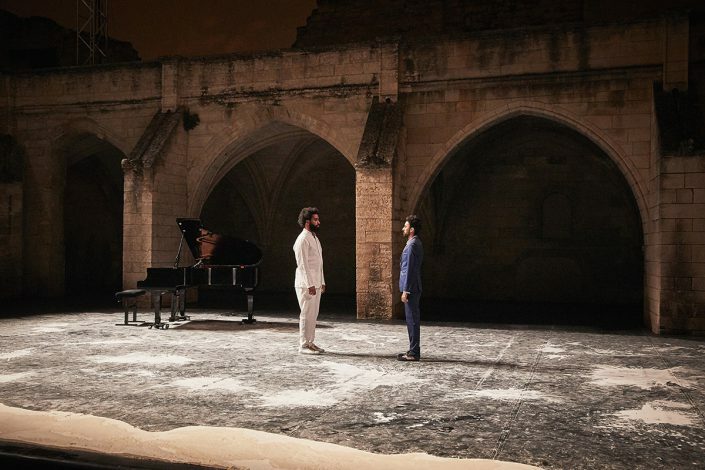 This interview was conducted for the 71st edition of Festival d’Avignon 2017.